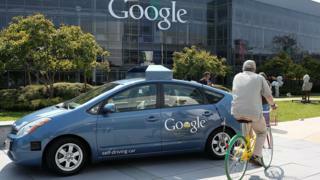 Driverless cars could initially lead to longer delays on the UK's major roads, according to a government report. The Department for Transport predicted a "decline in network performance" once one in four cars become driverless. The average time spent delayed on city roads at rush hour will fall by 12.4% when 25% of vehicles are driverless. The DfT said early models of the vehicles acted more cautiously and the result could be a "potential decrease in effective capacity" on motorways and A roads. But as more people adopted the technology and it became common place on the country's road network, the study found that congestion could be cut by 40%. Steve Gooding, director of motoring research charity the RAC Foundation, said: "There's a prize to be had in terms of swifter, safer journeys, but the transition to that world will be challenging. "There are around 32 million conventional cars on the UK's roads - as driverless cars come in, traffic flow could initially get worse rather than better, potentially for many years. "Much will depend on how an autonomous car's parameters are set and just how defensively these vehicles will be programmed to drive." The study used software to map out the effects of the cars on the road network. The DfT said the report was the first step into more trials and researching, ensuring driverless cares are "safe and beneficial for all". Transport minister John Hayes said: "This exciting and extensive study shows that driverless cars could vastly improve the flow of traffic in our towns and cities, offering huge benefits to motorists including reduced delays and more reliable journey times." Ministers are also planning to extend existing insurance cover to driverless vehicles, covering individuals when they are driving and when they have handed over control to the computer. In the event of a crash caused by the technology, a government consultation document suggests the driver and anyone else affected should be able to claim from the insurer and, in turn, the insurer would be able to claim compensation from the manufacturer. In the document, the government adds it will incorporate the insurance proposals for automated vehicles forward into the Modern Transport Bill, which is expected to be debated by MPs later this year.